Plover House & Tern Place01263 712201work01263 715984fax Self-cateringThe property is situated within an Area of Outstanding Natural Beauty & only a stone’s throw away from the sea. You are within 2 miles of Holt and very close to Cromer, Fakenham, Blakeney and many other beautiful coastal towns, but you have the advantage of being able to escape the hustle and bustle and retreat to the peace and tranquillity of the countryside. We welcome our visitors from 4pm onwards and check out time is 10.00am on departure day. Our usual changeover day is Friday and out of season we do 3 & 4 night breaks. We have a cot and high chair permanently in Tern and Plover for clients use. Up to 2 well behaved dogs are allowed, but we ask that they are not left on their own for more than a few hours. Any damage done by them will be charged to the clients. The garden at Tern is not fully dog proof, but the courtyard in Plover is. Both properties have a beach hut for storage of bicycles etc. Wireless broadband, telephone & FreeSat are standard in our holiday houses. Both properties are set over one level making them well suited to those with young families or perhaps those with mobility difficulties. Outside there is ample parking at the houses. There is a shared indoor heated swimming pool, 2 all weather tennis courts and a children's play area. Both have outside seating for 8 as well as a BBQ and a beach hut for storing cushions, bikes etc. 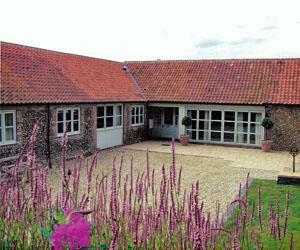 The property is situated within an Area of Outstanding Natural Beauty & only a stone’s throw away from the sea. You are within 2 miles of Holt and very close to Cromer, Fakenham, Blakeney and many other beautiful coastal towns, but you have the advantage of being able to escape the hustle and bustle and retreat to the peace and tranquillity of the countryside. Indoor swimming centrally and Tennis courts located within 100 yards of all properties. Cycle storage available. Children welcome from any age. large paved patio outside front door.